grassroots education for residents and their elected officials. Purchase more than one so you can share! These are suggested donations to help us cover the cost of the materials & fees. 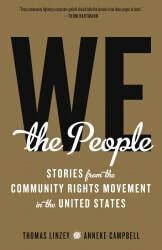 We the People 2.0 is a visual essay about the loss of democracy in the United States. The film utilizes both original footage as well as found footage to describe a profound change in thinking at the grassroots level. The story unfolds through the eyes of rural people who have faced decades of toxic dumping, drilling and mining in their communities. We learn with them that the reason why, in spite of all their efforts, they “get what they don’t want, again and again,” is because they are, by law, truly powerless in spite of propaganda that says they live in the “best democracy in the world.” These people come to understand that the reason they can’t stop the destruction is that the US has become an oligarchy, run by the corporate few who ignore the rights and will of the people. These people are frontally challenging our corporate state; thereby saving nature and themselves. Thomas Linzey, a nonprofit attorney’s inspiring words shows how, we, the people, can turn this around. Omitting any of this vital information could prevent us from successfully fulfilling your order. 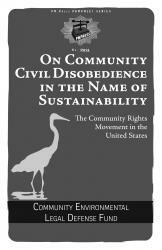 ​A revolutionary handbook portraying communities across the U.S. who have responded to environmentally destructive corporate projects by banning them locally. These are the inspiring voices of ordinary citizens and activists practicing a cutting-edge form of organizing developed by CELDF. Instead of fighting against what we don't want, this is about creating, through local community self-government, what we do want. Communities are refusing to cooperate with the unjust laws that favor corporate profit over local sustainability. They are leading the way forward. Across the country, they working to drive their rights into state constitutions and, eventually, in the federal Constitution. ​Our existing system of law is aimed at constant growth, development, and extraction - and conventional environmental advocacy works around the edges of this system, rather than takes it on directly. Unsurprisingly, more than forty years after our major environmental laws were passed - from species loss, to toxins in the environment, to global warming - things have gotten worse. It's time to change our activism to focus on changing the system itself, rather than continuing to work around it.